We’ve grown deep roots and are here to stay. When John Bosak first began selling automobiles in 1926, he was planting the seeds that would eventually blossom into the Bosak Automotive Group. 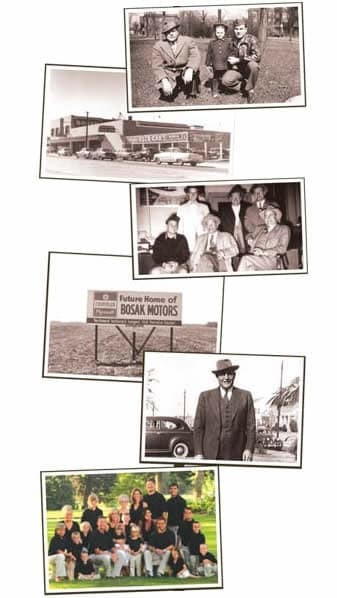 In 1928, John opened his own dealership, Bosak Motor Sales, which eventually became a franchised Chrysler dealer in 1936. Over the years, Bosak Chrysler flourished, first under the guidance of John, and then under his two sons, Michael R. “Bud” Bosak and John “Jack” Bosak II, who both assumed leadership after John Senior retired in 1948. After Bud’s untimely death in 1973, Jack moved Bosak Chrysler Presidency in a bold new direction, taking advantage of a burgeoning Route 30 corridor to build his flagship Bosak Chrysler facility in Merrillville, Indiana. Now, not only could the Bosaks offer their customers more inventory than ever before, the Bosak family brought forth an unbelievable car-buying experience, something that was unlike anything that area had ever seen before. And it was firm belief on how to treat people right that remained steadfast over the years, strengthening and continuing through the 1970’s and into the 1980’s, when the next generation of Bosaks, Skip, Cary and Greg, entered the family business. After Jack Bosak passed away in 1994, Cary became President and Skip Vice-President, with Greg assuming control of the newly-purchased Bosak Honda. It was also the introduction of Jack’s daughter, Theresa, into the business where she proudly served as Vice President. The Bosak family expanded even further, when in 1995 the added a failing Jeep franchise and increased sales an amazing 400% over the following three years. 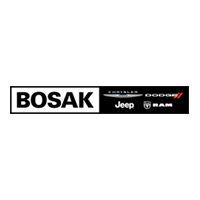 In 2009, the Bosak Automotive Group went on to add Dodge to the Bosak Chrysler Jeep store in Merrillville and then proudly opened a second Honda dealership in Michigan City, Indiana in 2010. Now more than ever, the Bosak Automotive Group has become synonymous with superior sales, selection and service. Their vision provides an exceptional car-buying experience. It’s a vision that’s always evolving as the family continuously seeks the most effective ways to better service their customers.